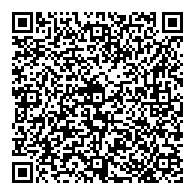 Focus your smart phone on any QR code below, then click your QR recognition app. Or mouse click any QR Code graphic to get just that graphic, with nothing else surrounding it inside the browser window. (to print or stick on back of your business card or sales leaflet, or to make sure your camera sees only the right QR code). Let me know if problems. Wikipedia on QR (Quick Response) codes.